that are very special and dear to our hearts. St Joseph’s Hospice, the first hospice in the country, was founded in London’s East End in 1905. In October 2001, St Joseph’s cared for our very dear friend and fellow entertainer, Colin Devereaux who worked as Dockyard Doris. In Colin’s memory, we started to raise money to pay for a room in the new wing of the Hospice. It took three years to raise the £33,000 and the Devereaux Room is a fitting memorial. Since then we have continued to raise money for this very worthwhile cause, reaching nearly £150,000. Formed in 1920, The ‘Not Forgotten’ Association provides entertainment and respite care breaks for serving and ex-service men and women who have been disabled during or as a result of conflict. As well as raising money for the Association we are lucky enough to do a three-week tour of homes for ex-service men and women between Broadstairs and Birmingham. Sadly, there are now young men returning from Afghanistan with terrible injuries, and ‘Not Forgotten’ takes them on Adventure Holidays with counselling session included to help them readjust . We are proud to help them with their invaluable work. The Dame Vera Lynn Trust funds a school that teaches the parents of pre-school age children with cerebral palsy how to deal with the difficulties those children will encounter. Each morning and afternoon small groups of parents bring their children (from babies to five years of age) for physiotherapy, and exercises that encourage them to use to the fullest extent the mobility that they have. The School makes no charge to parents, receives no government subsidy and relies solely on charitable donations. We are delighted to be Ambassadors for the Trust and do all we can to help raise funds. 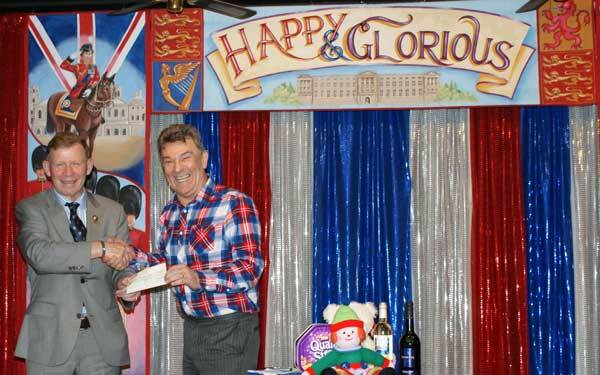 At our year 2000 run of ‘Bless ‘em All’ we raised £1,000 for The Royal Hospital and Home, Chelsea, refurbishment fund. Our friends The Chelsea Pensioners also come along as our guests to lunches and shows at Wood Green. We also pay for an annual show for Lest We Forget which is another provider of entertainment for disabled ex-service men and women. Included in their clients is Combat Stress which looks after the mental welfare of Veterans.